While there is a need for good quality care for patients with serious reversible disease in all countries in the world, Emergency and Critical Care tends to be one of the weakest parts of health systems in low-income countries. We assessed the structure and availability of resources for Emergency and Critical Care in Tanzania in order to identify the priorities for improving care in this neglected specialty. Ten hospitals in four regions of Tanzania were assessed using a structured data collection tool. Quality was evaluated with standards developed from the literature and expert opinion. Important deficits were identified in infrastructure, routines and training. Only 30% of the hospitals had an emergency room for adult and paediatric patients. None of the seven district and regional hospitals had a triage area or intensive care unit for adults. Only 40% of the hospitals had formal systems for adult triage and in less than one third were critically ill patients seen by clinicians more than once daily. In 80% of the hospitals there were no staff trained in adult triage or critical care. In contrast, a majority of equipment and drugs necessary for emergency and critical care were available in the hospitals (median 90% and 100% respectively. The referral/private hospitals tended to have a greater overall availability of resources (median 89.7%) than district/regional hospitals (median 70.6). Many of the structures necessary for Emergency and Critical Care are lacking in hospitals in Tanzania. Particular weaknesses are infrastructure, routines and training, whereas the availability of drugs and equipment is generally good. Policies to improve hospital systems for the care of emergency and critically ill patients should be prioritised. Emergency and Critical Care (EaCC) is one of the weakest parts of health systems in low-income countries . Defined as the care given in hospital to patients with serious reversible disease, EaCC encompasses both the emergency care on arrival plus the care of inpatients when in a critical state. There is a need for EaCC in all countries in the world, irrespective of local resources . The global burden of critical illness is difficult to quantify but is especially high in developing countries [3, 4]. Ninety percent of trauma deaths and ninety percent of deaths from pneumonia, meningitis and other infections occur in low or middle income countries [5, 6]. Ninety-nine percent of global maternal mortality is in developing countries . Seventy-Five percent of the 7.6 million children under 5 who die each year worldwide are in Africa or Asia . Fifty percent of child deaths in hospitals in developing countries occur within 24 hours of arriving at the hospital . Although the majority of critically ill patients in developing countries are children and young adults, reported fatality rates are high: mortality for severe head injury in Benin is 70% and mortality for septic shock in Tunisia is 82% . Several studies have reported deficiencies in care for seriously ill children [11, 12] and in emergency obstetric care  in low-income countries. However, to our knowledge, there are no published studies looking at the quality of EaCC across all disciplines and no single-country analyses of EaCC services . Tanzania is a politically stable, low-income country in East Africa. With a population of 44 million, Tanzania is ranked 152 out of 187 countries in the Human Development Index  (see Table 1). While Tanzania has some discipline-specific guidelines such as for obstetrics  or malaria , there are no national guidelines specifically for EaCC. The state of the services provided for the critically ill in Tanzania is largely unknown. In this study we aim to describe the structure and availability of hospital resources for EaCC in Tanzania as a starting point for the identification of priorities for improving care for this neglected patient group. All data from World Health Statistics 2012 . There are 21 regions in mainland Tanzania and 223 hospitals . Ten hospitals were selected for study feasibility from four regions of the country using convenience sampling, ensuring a mix of district, regional, referral-level and private hospitals. The hospitals were studied on single day visits by two of the investigators (EL and TB) between October and November 2009 after prior telephone contact. The investigators conducted the first five visits together so as to harmonise the conduct of the visits and how to collect the data. The subsequent five visits were done by a single investigator (two by EL, three by TB). The data was collected using a structured tool which further ensured consistency in data collection. A structured interview was conducted with the head of the hospital and all areas of the hospital involved in EaCC were visited and the facilities assessed using a data collection tool divided into hospital specialties to ensure that the facilities for all patient groups were observed (available in the Additional file 1). As there have not been any published Tanzanian or international guidelines specifically for EaCC in low-income countries, we first developed a set of standards. Three of the researchers (TB, DK, JE) reviewed the literature and extracted relevant standards from international guidelines for trauma , paediatrics [21, 22], surgery [23, 24] and anaesthesia . We used an “expert group” process to revise these standards. The expert group was comprised of the six researchers plus ten anaesthesiologists and physicians currently working or with recent experience of working in low-income countries (see acknowledgements). The researchers conducted several face-to-face meetings and the expert group were consulted via email and telephone. Due to resource and time constraints we were unable to organise a formal Delphi method or a face-to-face meeting of the whole expert group. A final document of 104 indicators were decided upon that describe the minimal structural requirements for EaCC in low-income countries (available in the Additional file 2). For the purposes of this study, 19 of the indicators were disregarded. This decision was taken by the researchers prior to data collection due to the risk that the many drug and equipment indicators (60 of the 104 indicators) would weigh the study too greatly towards the availability of these items. To assess whether the hospitals had extra resources beyond the minimum required for EaCC we selected a further ten indicators for “Advanced EaCC” from international best-practice guidelines . Processes and outcomes of EaCC were not evaluated. The indicators were divided into eight sections: infrastructure; human resources; training; drugs; equipment; routines; guidelines; support services. Where data was missing from four or more hospitals the indicator was excluded (apart from indicators in the routines and guidelines sections where missing data was judged likely to be due to an absence in the hospital). The hospitals were stratified into two groups: district/regional and referral/private as we hypothesised that resources would differ between the groups. We calculated the proportion of hospitals where each resource was available. We calculated a “resource availability score” for each hospital, subdivided into indicator sections, as percentages of available resources with missing data excluded. Due to the small sample size, inferential statistics were not used. Ethical clearance was granted by the National Institute for Medical Research in Tanzania (NIMR/HQ/R.8a/Vol.IX/846) and permission for the study was granted by The Tanzanian Commission for Science and Technology (Costech) and district authorities in each study district. All interviewees gave informed consent to participate and were informed that they could withdraw from the study at any time. Of the ten hospitals included in the study, four were district hospitals (secondary care), three were regional hospitals (tertiary care), two were national referral hospitals (quaternary care) and one was a privately owned mission hospital (Table 2). The hospitals were located in four regions with a total population of 6.8 million (18% of the population of mainland Tanzania) . All the hospitals divided patients up into specialty with separate admissions systems for adults and children. Obstetric patients were seen directly in the obstetric wards and were excluded from the analysis. Number of beds divided into three groups: <200; 200-400; >400. ICU Intensive Care Unit, locally defined by the hospitals. Of the 104 indicators in the standards, 74 were used for the analysis. 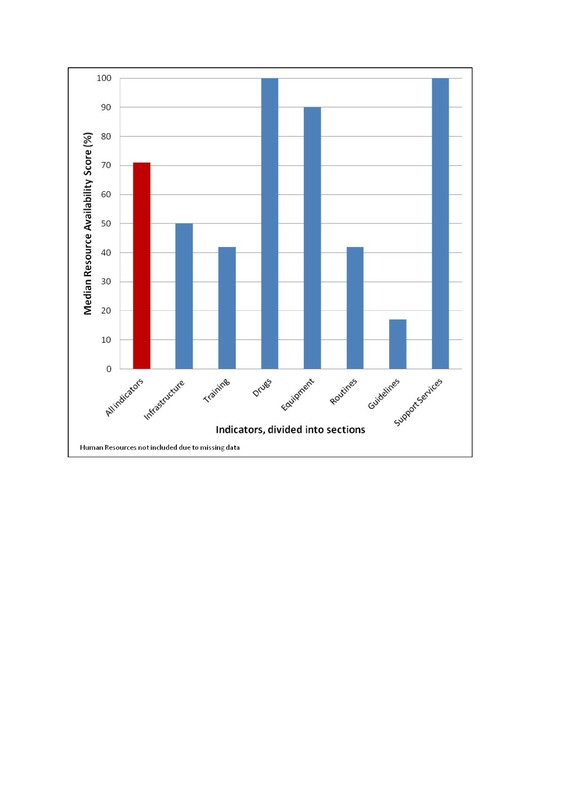 Nineteen equipment and drug indicators were disregarded to avoid weighting the study too greatly towards these items and eleven indicators were excluded due to missing data from four or more hospitals. The availability of each resource is shown in Table 3. A “Resource Availability Score” was calculated as the percentage of resources available in each hospital. The scores ranged from 57.1% to 92.1% with a median of 71.1% (Table 4). The referral/private hospitals had higher scores (median 89.7%) than district/regional hospitals (median 70.6%). Across all hospitals scores for infrastructure resources (50.0%) and for EaCC routines (42.2%) were lower than drugs (100%) and equipment (90.0%) (Figure 1). Emergency and critical care resource availability scores in ten hospitals in Tanzania. Data given as a percentage of the hospitals where each resource was available. * missing data is shown with one asterix (*) per missing hospital. Where data is missing for all hospitals in a section a dash is shown (-). ER Emergency Room; ICU Intensive Care Unit; IV Intravenous; IM Intramuscular. * Resource availability scores calculated as a percentage of the resources available in each hospital. Averages calculated as the median score of the hospitals. In three hospitals there was a triage area for adults, and three hospitals had a triage area for children. Three hospitals had an emergency room (ER) for both children and adults. A further three had an ER for adults only and two hospitals had an ER for children only. Where an ER was not present the general outpatients department or the inpatient wards were used for emergency patients. Three hospitals had a ward that was designated as an Intensive Care Unit (ICU). The level of critical care provided on the ICUs varied: from ventilators and electronic patient monitors to a simple increase in the nurse: patient ratio and more frequent patient observations. In the other hospitals critically ill patients were cared for on general wards; two hospitals had a specific ward area for critically ill adults and nine hospitals had designated beds for critically ill children. The referral/private hospitals had a greater availability of infrastructure resources (median 100%) than district/regional (median 50%). None of the district hospitals had a triage area, Emergency Room or an ICU. Specialist Anaesthesiologists (the specialty in Tanzania responsible for Critical Care) were present in only the two referral hospitals. In two hospitals the anaesthetic service was staffed solely by nurses. In the other hospitals non-physician clinicians were present alongside nurses. These included Clinical Officers (staff with three years of college training) and Assistant Medical Officers (Clinical Officers with two further years of clinical training). Anaesthetic staffing was low in comparison to other medical staff (Table 2). In none of the hospitals had all the staff involved in EaCC been trained in triage, emergency care or critical care. The indicators were therefore adjusted to show if hospitals had “any” staff instead of “all” staff trained. Twenty percent of hospitals had at least one staff trained in adult triage and 20% had at least one staff trained in adult critical care. Training was most prevalent in Paediatric critical care with 80% of hospitals with at least one trained staff. Three hospitals (30%) had at least one staff who had been trained in the World Health Organisation’s paediatric training in “Emergency Triage & Treatment” (ETAT) . Intravenous fluids, parenteral opioids, diazepam, and antibiotics were available in all the hospitals where data was accessible as were blood pressure cuffs, naso-gastric tubes, suction machines and gloves. Oxygen was available in nine of the ten hospitals. Oro-pharyngeal airways were only found in six hospitals and salbutamol for inhalation in six out of nine hospitals. Reliable electricity with a backup generator was present in 50% of the hospitals (one of the district hospitals, one of the regional and all of the referral and private hospitals). The district/regional hospitals had slightly less availability of drugs and equipment than the referral/private hospitals (medians 86.7%, 100% respectively). Forty percent of hospitals had formal systems of triage for adults and 44% had systems for prioritising the management of critically ill adults. Similar rates were seen for children. Registration and payment was delayed until after triage and emergency treatment at all hospitals for children and all except one for adults. Once admitted, 83% of hospitals had routines for increasing the frequency of observations for critically ill adults. However, ward rounds by clinicians were carried out more than once daily in only 30% and 33% of hospitals for critically ill adults and children respectively. There were no written guidelines for adult triage, emergency treatment or critical care in any of the district or regional hospitals. All hospitals had the facilities for checking haemoglobin, conducting bacterial gram stain, and performing chest x-rays. 80% of hospitals could perform bacterial cultures and sensitivities, 90% could measure serum electrolytes. All hospitals could give emergency blood transfusions, 80% could do this within one hour of receiving a blood group specimen. Mechanical ventilators were present in 40% of hospitals, arterial blood gas monitoring in 20% and central venous pressure monitoring in 1 hospital of 10 (data not shown). A median of 25.0% of all indicators were available across all hospitals, with 20% in district/regional hospitals and 80% in referral/private hospitals. We have shown that hospitals in Tanzania lack many structures necessary for Emergency and Critical Care (EaCC). Our study has found that the weakest parts of EaCC are an infrastructure that is not designed for managing critically ill patients, a lack of routines for the prioritisation and management of the critically ill and a low level of EaCC training among staff. In contrast, we have shown that hospitals are well stocked with drugs and equipment necessary for EaCC. Our study highlights the quality gap between the better resourced referral and private hospitals and the less resourced district and regional hospitals suggesting that while there is some capacity for EaCC in Tanzania, it hasn’t reached out to the smaller centres. This study is, as far as we know, the first attempt to analyse the structural capacity for EaCC in a low-income country. As such its strengths are in highlighting this pressing need, to introduce standards for EaCC and to suggest likely causes of the reported weak performance and poor outcomes of EaCC in low-income countries [10, 27]. Similar insights can be seen from the Tanzanian Service Provision Assessment Survey 2006  where only 19% of hospitals nationwide had the facilities to support 24-hour emergency services and from studies focusing on paediatric inpatient care [12, 29]. The sample size of ten hospitals is the study’s main weakness, limiting the generalisability to the whole country, and the single-country setting limits international generalisability. The experience of the authors is, however, that similar findings can be seen in many other hospitals in Tanzania. Recent studies in related disciplines have shown findings consistent with our results in the Gambia , Zambia , Mongolia  and in sub-Saharan Africa . A further limitation is the lack of some data due to unavailability of information when the hospital visits were conducted. The processes and outcomes of EaCC were not observed in this study; the existence of certain equipment in a hospital does not mean it is in working order or in the correct place, used for the correct patients and at the correct time. So why is the quality of EaCC so poor? It has not been prioritised politically or medically as it cuts across many disciplines, is not age or disease specific and there are very few Emergency or Intensive Care specialists. There is a belief that EaCC requires sophisticated or expensive equipment, although the basic EaCC that is the focus in this study such as adequate fluid resuscitation, intravenous dextrose for hypoglycaemia and oxygen for hypoxia are not expensive . In our experience, fatalism among staff with low morale is common and self-fulfilling. Improving the service could lead to decreasing mortalities, which in turn could challenge fatalism. Vertical programs, while successfully tackling single diseases, have been less successful at strengthening health systems . Programs for Essential Trauma Care , Emergency Obstetric Care , Hospital Care for Sick Children , Integrated Management for Adolescent and Adult Care  and Emergency and Essential Surgical Care [30, 38] have all been initiated by the WHO in the past few years. A common theme is the view that improving care for very sick patients is urgently required and would have the potential of reducing preventable mortality. A focus on EaCC could be a way of coordinating efforts in these programs. There is a potential for improvement in EaCC. Recognising very sick patients quickly and instituting simple treatments has been the focus of much recent work in high-income countries with the introduction of Rapid Response Teams [39, 40]. The same principles apply in low-income settings: one study from Tanzania has shown that simple triage using vital signs can predict which patients have a high risk of mortality . Reorganising a paediatric hospital admissions system in Malawi to include triage and emergency care reduced hospital mortality by 50% . Intensive Care Units providing basic critical care are likely to be cost-effective due to a concentration of staff, skills and equipment close to the patients who need it most . Improving levels of training is a vital issue in Tanzania and other low-income countries . Critical Care is a subspecialty of Anaesthesia in Tanzania, and there are less than 20 specialist anaesthesiologists for a country of over 40 million people. Before 2009, when the first post-graduate training for doctors in Emergency Medicine was initiated, Tanzania had not trained any doctors in the speciality. Aside from the WHO’s paediatric ETAT program, there was little evidence of training courses in Tanzania in caring for emergency or critically ill patients. The almost complete lack of guidelines that we observed implies that standardised and evidenced based care is not being followed. Although guidelines alone have not always been seen to improve outcomes they may have the potential to improve quality of care if introduced through a multifaceted approach, targeting knowledge, motivation, resources, and the organisation of care [45–47]. These patients do not have the luxury of waiting, and introducing training, routines and guidelines to improve the processes of care may lead to reduced mortality and morbidity. A striking finding in the study is how well stocked the hospitals were with drugs and equipment necessary for basic EaCC. This suggests that a lack of the basic tools for EaCC cannot be blamed for deficiencies in the quality of care. Drugs and equipment for advanced care were mostly absent, but this should be seen rather as a rational prioritisation of resources than as a deficiency. This study indicates to policy makers that improving the hospital systems for the care of emergency and critically ill patients in Tanzania should be prioritised. Improving the routines for managing these patients, increasing the human resources and training levels and improving the infrastructure may be the best ways to achieve this. Further research is required into the quality of the processes of EaCC and intervention studies are needed to assess the mortality and morbidity reductions and cost-effectiveness of improving EaCC. Thank you to Isabeau Walker, Ray Towey, Iain Wilson, Martin Dunser, Mike Dobson, Elizabeth Molyneux, Stefan Jochberger, Maria Teresa Leiva, Bruce McCormick and Ulrika Baker for useful comments and additions to the Standards and Data Collection Tool. The study was funded by grants from the Laerdal Foundation, the Association of Anaesthetists of Great Britain and Ireland and the Karolinska Institutet Travel Grant. The funding sources had no role in the design, conduct or reporting of the study. TB contributed to the conception and design of the study, acquired, analyzed and interpreted the data, and drafted and revised the manuscript. EL contributed to the design of the study, acquired the data and critically revised the manuscript. JE contributed to the conception and design of the study and critically revised the manuscript. VM contributed to the conception of the study and critically revised the manuscript. LI contributed to the conception of the study and critically revised the manuscript. DK contributed to the conception and design of the study, analyzed and interpreted the data and critically revised the manuscript. All authors read and approved the final manuscript. Global Initiative for Emergency and Essential Surgical Care (GIEESC). http://www.who.int/surgery/globalinitiative/en/.